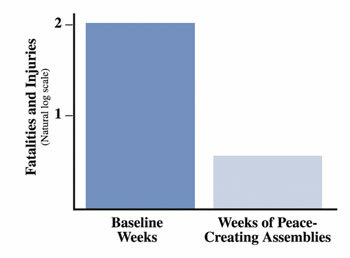 The unique effectiveness of the Consciousness-Based Approach to Peace in preventing social violence, terrorism, and war has been confirmed by more than 50 replications including 25 studies published in leading peer-reviewed scientific journals or conference proceedings. This research has been carefully scrutinized by independent scholars and accepted for publication in top academic journals (see references). In every case, this approach produced marked reductions of crime, social violence, terrorism, and war, and increased peace and positivity in society. A critical experimental test of the Consciousness-Based Approach to Peace was conducted during the peak of the Lebanon war. 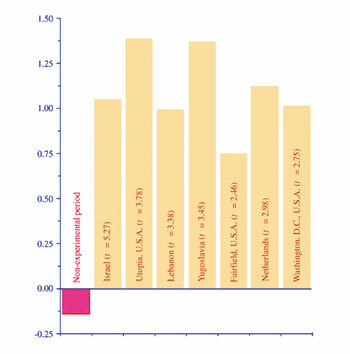 A day-by-day study of a two-month assembly in Israel in 1983 showed that, on days when the number of participants in this Unified Field-based approach to defense (“TM Group Size,” right) was high, war deaths in neighboring Lebanon dropped by 76% (p < 10-7). 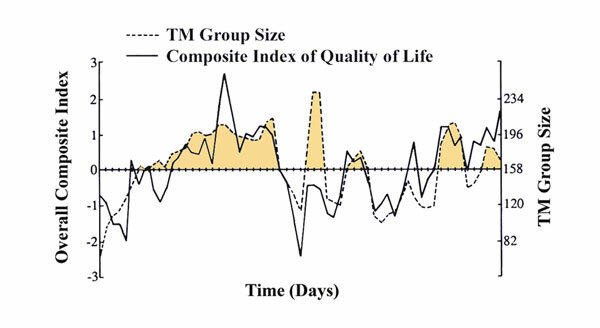 In addition, crime, traffic accidents, fires, and other indicators of social stress in Israel (combined into a Composite Index) all correlated strongly with changes in TM group size. Other possible causes (weekends, holidays, weather, etc.) were statistically controlled for (Journal of Conflict Resolution 32: 776-812, 1988). There is now a strong and coherent body of evidence showing that [this approach] provides a simple and cost-effective solution to many of the social problems we face. A National Demonstration Project conducted in Washington, D.C., from June 7 to July 30, 1993, tested the efficacy of the Consciousness-Based Approach to Peace for reducing crime and social stress and improving the effectiveness of government. These are just a few of the more than 50 scientific demonstrations and 23 published studies on this Consciousness-Based Approach to Peace. These studies are backed by more than 600 other published studies conducted at over 200 independent universities and research institutes in 30 countries on the individual and societal benefits of these Unified Field-Based, Consciousness-Based, technologies of consciousness. This extensive body of scientific research makes the unique approach of the Global Country of World Peace the most thoroughly tested and rigorously established peace-creating technology in the world today.